On Sept. 7, 1991—25 years ago today—Brooks & Dunn’s debut single, “Brand New Man,” reached No. 1 on Billboard‘s Hot Country Songs chart. 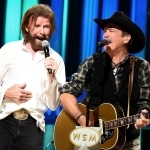 Penned by Kix Brooks, Ronnie Dunn and Don Cook, “Brand New Man” was the title track to the duo’s debut album, which was certified 6X-platinum.